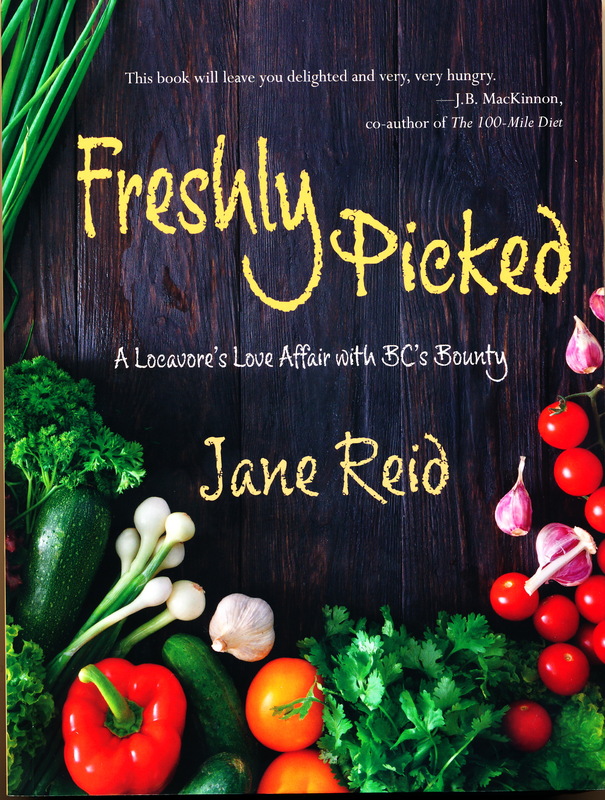 In Freshly Picked, Jane Reid’s goal is to help us better understand the food crops grown in BC – where food grows, when it’s available fresh, and ways of preparing and enjoying it. The book is organized according to Spring, Summer, Fall and Winter and each section contains subsections on foods available in that season. For example in Spring, there are subsections on asparagus, greens, radishes and onions, rhubarb, nugget potatoes and peas. In the subsections on various foods, Reid writes about the global history of the food, where it is grown in BC, shares family stories, past experiences with growing, harvesting and preparing, how and where to buy, and simple ways of preparing. We are able to glean interesting history about most of the foods that Reid writes about. For example, she writes that rhubarb became a widely accepted food, “When ordinary people could finally afford to buy sugar to sweeten bitter rhubarb in the 1700s” (p. 36). She further explains: “Russians brought rhubarb with them when they settled Kodiak Island in 1784” (p. 39). We learn that we now enjoy a wide variety of garlic in our markets because the fall of the Berlin Wall in 1989 opened the West to eastern European varieties. And, that we’ve been enjoying strawberry shortcake since 1509 when Thomas Wolsey thought to combine strawberries and cream. These are only some examples of the many small pieces of history contained in the book. Reid provides gentle encouragement to become a locavore. She suggests that you begin by growing some of your own food, knowing about what is in season, planning meals around food that is locally available and finding local sources. She also advocates for using U-picks and preserving foods in season. She provides suggestions for online sources and further reading. Freshly Picked contains many beautiful colour photos and the informative text keeps us turning pages and enjoying every moment. This is a delightful winter read that far surpasses the Canadian pastime of browsing seed catalogues in February. It will be useful especially to newcomers to BC who wish to understand more about growing regions and available foods. It will help those who are seeking support and encouragement to eat more local foods. And, it’s a book for anyone who cares about what they eat. At first glance you will not realize that this book also contains 27 recipes because the recipes are written into the text, in paragraph format. As I read the book, I made my own list of recipes with page number and it was not until I finished that I realized the list of recipes appears in the index under “recipes.” While I can understand the wish to have the book appear as something other than a recipe book, a list of recipes up front after the table of contents would greatly assist the reader and appeal to a wider audience that often wants preparation ideas in addition to information. Thanks for the review, the book sounds interesting.